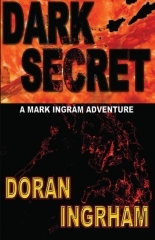 Doran Ingrham’s novel, Dark Secret, his newest Mark Ingram novel, sizzles with more intrigue, excitement and, yes, wit. When Mark Ingram takes on a contract to provide security for wealthy Joris Barnhardt and his family, he has no idea of what will be discovered. What are the secrets unearthed by Mark Ingram and his team? A must read for all readers. Mark assembles his team to protect Barnhardt and his family. They learn a lot about their wealthy employer that is unexpected, but they continue their protection until the end. In the middle of the adventure and excitement, they also free a couple being held for ransom. You will be intrigued by this whole adventure from beginning to end. The main plot and sub plots are filled with explosive escapades and humorous dialogue. It keeps your attention all the way to the end. As a retired librarian, I know that libraries are always looking for books that will hold the attention of the reader. Dark Secrets does just that. I consider Mr. Ingrham to be an author in the same class as Tom Clancy, W.E.B. Griffin and Larry Bond.